I’ve never met anyone who doesn’t like watermelon. Along the Dalmatian coast, that meant being greeted with smiles everywhere. Leaving Ploce, sailing north on our long trip home, we traveled through the islands and sold the bright red fruit to boats and restaurants all along the way. Like Ulysses, that great Adriatic sailor returning home, but with watermelon. The first stop was Peljesac ( Pel-yay-shats), the long peninsula extending the mainland, almost an island except for a small sliver of land. By this point the students were used to their watch schedule, working the boat, trimming sails, steering and checking bilges when they were on; and sleeping when off watch. We sailed for four hours north up the Peljasac peninsula, tacking out and back in the big channel, making progress up the coast. Our goal was the town of Trpanj on Peljesac. Unfortunately the head winds kept us from entering the harbor, with waves crashing on the town’s pier and our only mooring. We decided to continue on to the tip of the peninsula and anchor there. The many winds of the Adriatic all have names. Each wind has a personality, with characteristics that one learns to recognize. On this day our wind was Maestral, the great summer wind that blows from the north west. In the morning, we enjoyed the company of Bura, the gusty north east wind coming from the mountains. With Bura we sailed to the small island of Scedro, just a couple kilometers off the southern coast of Hvar. Here we found people eager to buy our watermelons. 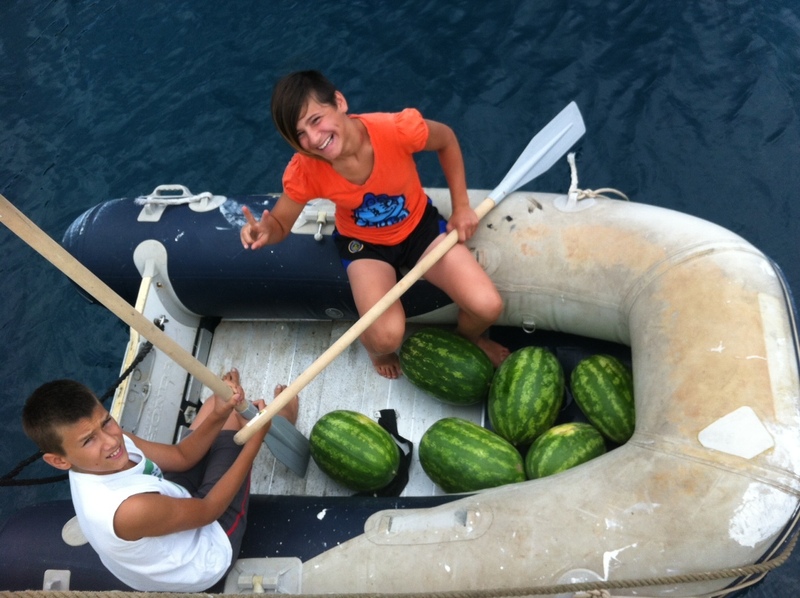 The students loaded our small pontoon boat with melons, and paddled around the small harbor successfully selling watermelons to delighted sailors around the protected cove. The entrepreneurial students had a lot of fun raising money for their home. The melons went out and the money came back, almost 700 kuna or 100 euro for seven watermelons. Debating later what that might buy for their home, they decided on a new DVD player. Off we went, with Peljesac and Scedro behind, sailing around Hvar, and by Pakleni, Brac, Solta, island after island, selling watermelon along the way. Our island life could not be greater. The water is crystal blue and refreshing, fish swim all around, and we even tried fresh sea urchin. The sailing, the students now knew well, is lot of hard work, but the payoff is this great enjoyment of life on the sea. The young students, open to it all, were having great fun, the most important outcome of our voyage. From those good times, they will have good stories and memorable experiences for life. As a maritime teacher, that’s how I envisioned the trip, an experience to be remembered forever. For me, the crew and for them, watermelon will never be the same.